Why am I saying it’s a super handy sentence starter? Well, the reason behind that is simple enough – it’s a perfect way of starting a conversation with someone about something that you’ve heard somewhere, which is what a lot of conversations are all about! Let’s say, for argument’s sake, you want to tell your work colleague that there’s way more bacteria on the average mobile phone than on a toilet seat. In theory, nothing could be easier than that, right? Just open your mouth and tell him about it! 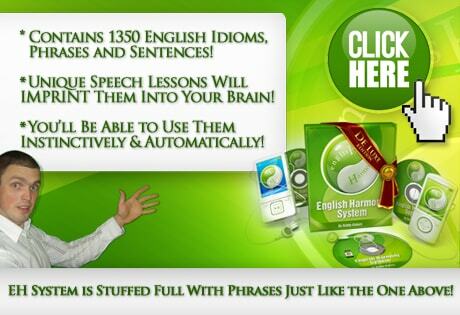 In reality, what a lot of foreign English speakers will struggle with is – HOW TO START THE DAMN SENTENCE! One way of going about it would be to simply state the fact: “There’s way more bacteria on the average mobile phone than on a toilet seat”, but in this case you’re really running the risk of sounding a bit awkward. I mean – who just says something like that out of the blue, right? You just have to admit that if you address your work colleague this way: “Listen Josh, I HEARD SOMEWHERE THAT there’s way more bacteria on the average mobile phone than on a toilet seat, isn’t that mad?” – it will sound way more native-like, and that’s exactly the way you want to sound! which can be used to refer to facts that you would have read somewhere instead of just heard somewhere. Let me know if you’ve any questions! Hi Robby…I’ve been following you for quite some time now and I must commend your works. Honestly, I have a feeling I’ve got all it takes to initiate and sustain conversations but I just keep falling into “oops”. I encounter hurdles every now and then. Hi Rob! how are you doing? Could you post the transcript? Thanks in advance! !